Intense, (melo)dramatic, and gratuitous war actioner. Gotta hand it to Michael Bay. No matter the bashing received he unapologetically keeps making films exactly the way he wants to make them. F*ck the critics! 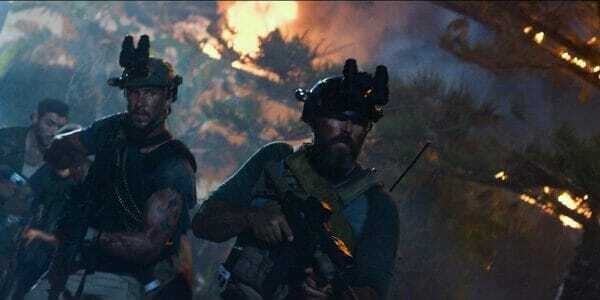 So with a leaner budget and a less bankable cast he jumps headfirst into modern warfare filmmaking in 2016’s ‘13 Hours: The Secret Soldiers of Benghazi‘. Despite Bay’s trademark theatrics this marks the best film he’s done since ‘The Rock’ way back in 1996, which really isn’t saying much. A reasonably grounded, well-acted, adrenaline-fueled “based on a true story” war film that holds our attention. In 2012, post-Gaddafi Libya is a complete mess. The CIA keeps a not-necessarily so secret station in the city of Benghazi, utilizing private military contractors for security. 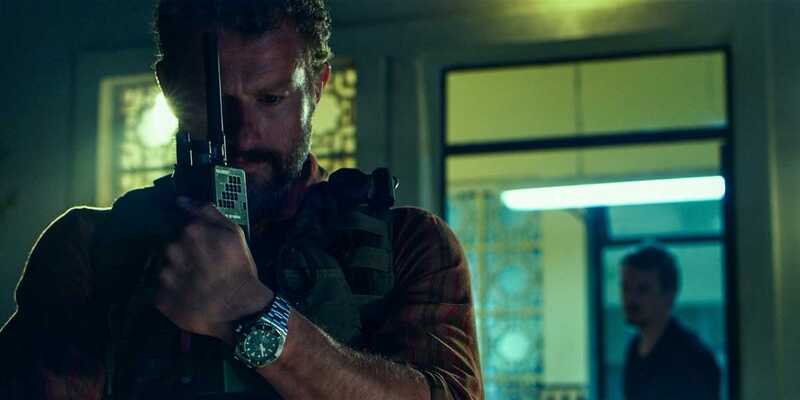 These “babysitter” mercs are led by the battle-weary ‘Rone’ Woods (James Badge Dale) and a fresh off the plane Jack Silva (John Krasinski, powerful). While most of the remaining security unit and support personnel, including a rotisserie of local police, get lost in the froth. When a “rock star” U.S. Ambassador arrives at a nearby compounded things quickly unravel. Local warlords and countless, faceless militia soon begin an attack on both compounds in a single, harrowing night. Grand effort to humanize these soldiers is made. We get family back home interludes and pre-battle camaraderie building tropes in abundance. Thankfully, Bay shows some restraint in allowing these actors a chance to act like genuine people instead of the macho, overconfident D-bags typical this genre. John Krasinski is a long way from ‘The Office’. ‘Rone’ (James Badge Dale) formulates a plan. “Hell breaks loose” is these guys’ specialty. Watching the fog of war confusion overwhelm these veteran soldiers is terrifyingly real. Of course, Michael Bay can’t help himself when it comes to the trademark melodramatics and sledgehammer displays of jingoism and heroic posturing. And, once again, Bay acts like he invented slow motion. Weightier films like Ridley Scott’s masterpiece ‘Black Hawk Down’ lets the war brutality and chaos stand without needless romanticism. ‘13 Hours‘, however, showcases patriotism and courage through cliched fist-pumping shenanigans and soundtrack enhanced slo-mo melodrama. I guess that’s the difference between entertainment and art. 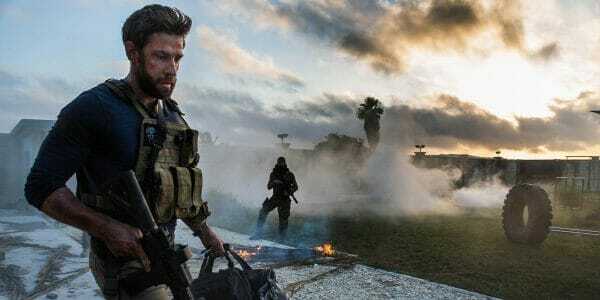 If you can forgive Micheal Bay’s guilty-pleasure instincts, ‘13 Hours: The Secret Soldiers of Benghazi‘ is an exciting, brainless war-actioner and solid entertainment. It doesn’t leave much lasting impact. But, at least, you won’t get all depressed and cynical about the state of the world…though, perhaps, you should. Michael Bay brings both his best and worst instincts to bear. 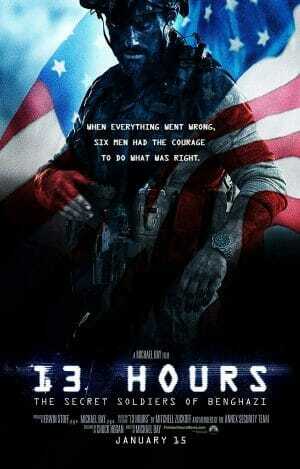 Adrenaline fueled action, jingoistic fist-pumping, and a complete disregard for sanity in war makes fine entertainment. Just don’t expect something thought provoking. – Indulgent –* Guilty pleasure entertainment.